What did Francis know? When did he know it? In Zanchetta case, can the pope answer questions? There are few relationships in the world of mainstream religion that are more private, and often mysterious, than the bonds between a priest and a penitent who comes to Confession. This is especially true when the priest hears the same person’s Confessions over and over for years — even taking on the role of people a believer’s “spiritual father” and guide in life. So what happens when a priest becomes a bishop? Bishops, cardinals and even popes need to go to Confession and some may even retain ties with their “spiritual fathers” as they climb the ecclesiastical ladder. I do so because of a fine detail way down in an Associated Press report that — for a moment, forget teens in MAGA hats and Twitter storms by journalists — may turn out to be a crucial turning point in the complicated story of Pope Francis and wayward bishops involved, in various ways, with sexual abuse. The pope's decision to allow Zanchetta to resign quietly, and then promote him to a new No. 2 position in one of the Vatican's most sensitive offices, has raised questions again about whether Francis turned a blind eye to the misconduct of his allies or dismissed allegations against them as ideological attacks. Yes, “naked selfies” in a Vatican story. Were these photos sent to others or kept for — oh well, whatever, never mind. But here is the detail that jumped out at me. An aide close to Zanchetta would not, of course, serve as his confessor. However, it’s highly likely that this aide would know the identity of his boss’ confessor or spiritual father. 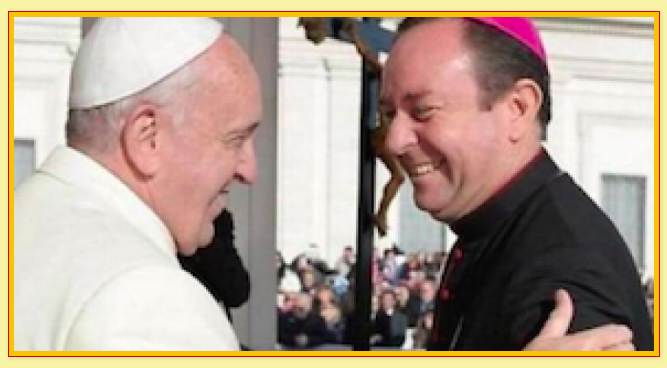 Cardinal Bergoglio was this priest’s spiritual father? Is that relationship still intact? I have a question for Catholic readers, especially anyone with canon law experience: Everyone knows that priests cannot discuss what they hear in Confession. But would the spiritual father, in such a case, be free to acknowledge that Zanchetta is one of this spiritual children? Could the pope answer questions about when this unique and sacred relationship began and when — if this is the case — it ended? Journalists often ask questions that echo the famous Watergate equation: What did the president know and when did he know it? In this case, Pope Francis may not be able to answer either of these questions. How does one testify about the sins — confessed sins or secret sins — of a spiritual son? Zanchetta largely disappeared from public view until the Vatican, in an official announcement Dec. 19, 2017, said Francis had named him to the new position of "assessor" in APSA, a key administrative department which manages the Holy See's real estate and financial holdings. While the Vatican's annual yearbook lists Zanchetta hierarchically as the top deputy to the APSA president, his exact duties were never clear since the job didn't previously exist. Stay tuned? To say the least. And watch for coverage in elite media on this side of the Atlantic.